Have you ever seen a superhero with bad pimply skin? Well maybe it could be argued that the The Hulk has some skin issues. Anyway, the Japanese company Isshin Do Honpo has just come out with a new line of facial masks that combine giving your skin an awesome healthy glow along with looking like a superhero. These officially licensed beauty products are called The Marvel Face Packs. 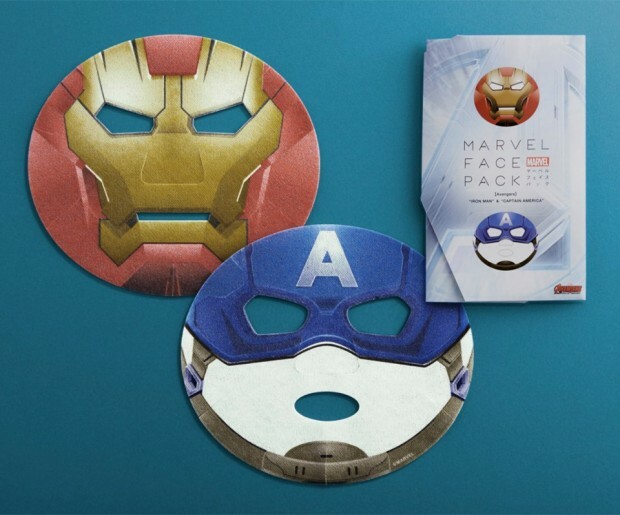 You get both Captain America and Iron Man superhero facial masks in one pack that costs $27(USD) – less if you live in Japan. The applicators look like the superheroes’ masks, but once you apply the skin-rejuvenating ingredients, which include hydrolyzed collagen, vitamin C derivative and lavender, you look as if you just got your face painted Marvel style. I think they would make a great gift for the beauty-conscious superhero fan in your life, however many of the online comments I have read about this product are snarky beyond belief, and border on the pornographic, so maybe there’s not a huge market for them out there after all.